Mr. Darshan Singh and Mr. Manmohan Singh originally from Punjab are settled in Tamil Nadu growing different varieties of fruits. They migrated to Vallandhai village, Ramanathapuram district in 2017 and turned the deserted land into fruit growing green belt. Locals in Vallandhai village left their farmlands desolate citing the reason, ‘no water, no farming’. Consequently the land prices dropped down to Rs. 15-20 thousand per acre. With no buyers and caretakers the land became barren until it caught the attention of Mr. Iqbal Singh, former Director of Agriculture, Himachal Pradesh. His experienced eyes knew soil is never infertile and can be revived if fostered by hard work. He advised Mr. Manmohan Singh and Mr. Darshan Singh to visit the village and do a survey on land prices, reason for discontinuing agriculture and check on feasibility of resuming farming. The duo as instructed travelled the distance of more than 3,000 km and rented a house in nearby city Virudhunagar. They found the village was under the dry spell with not a single tree around and farming was only dependent on rain. To re-start cultivation was a challenge but not an impossible task. Only gain was the land prices was too low allowing them to buy acres of land. Taking the step forward 15 friends back home pooled the money and bought 550 acres farmland. The ownership is held as per the investment made while the entire responsibility of developing and maintaining the farm was on the shoulders of Mr. Manmohan Singh and Mr. Darshan Singh. Till 2010 both of them were engaged in land procurement and travelled expansively across the state to gather as much as information available on farming in red soil and crops selection in alliance with the weather conditions. 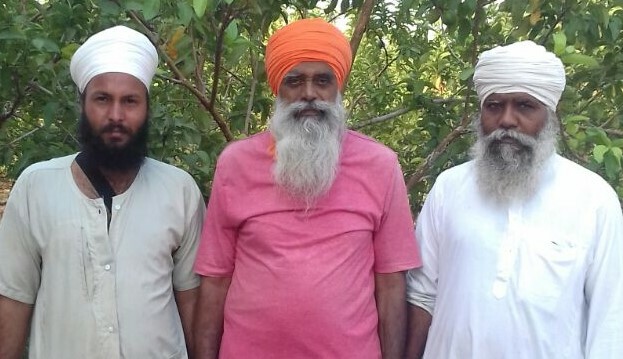 All their life till 2007 they primarily grew wheat and legumes in brown soil of Punjab but now it was the time to learn from scratch to grow food in different soil and climate. To begin with, they started clearing 150 acre land in the year 2010 as it was full of wild thorny bushes. They always had some helping hands from Punjab to carry on the difficult task ahead and continued to work with perseverance to bring the positive change in the land and environment. It took more than a year to make the land suitable for growing plants after tilling and leveling. By now they had decided on growing fruits commercially yet plantation was not possible till the water problem was resolved. They fixed borewells across 150 acre land to pull out as much as water available and collected it in the existed well. “We cleaned the well and stored all the water collected from the borewell in it. Simultaneously we installed drip lines for irrigation. We planned for mango, guava, papaya, coconut, jackfruit and gooseberries plantation thus accordingly the markings for drip were made so that not a single drop of water goes waste,” asserts Mr. Manmohan Singh. At last in 2012 the saplings were planted leading to the establishment of Akal Farms. 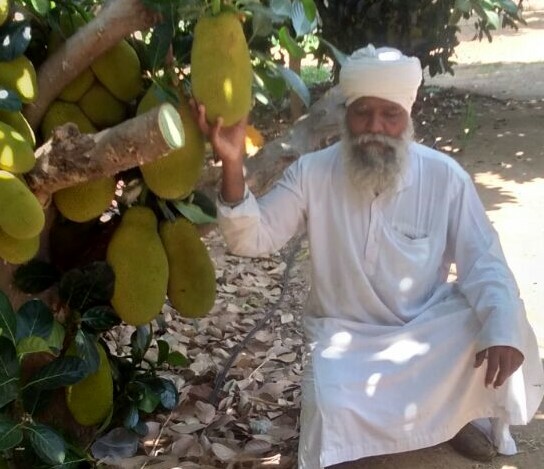 Four varieties (Banganapalle, Alphonso, Mallika and Imam Pasand) of mango were planted in 80 acre, guava (Lucknow 49) and gooseberry in 40 acres, coconut and papaya in 10 acres while rest of the farm has assorted trees namely jackfruit, lemon, custard apple, cashew nuts, almonds etc. Seasonal vegetables and grains are cultivated as inter-crops. “Mango saplings were primarily sourced from Salem while other plants from the nurseries located in towns near Madurai,” he informs. They worked with an open mind on the fruit trees selection. They tired numerous fruit plants in the batch of 10-15 saplings each and observed the growth carefully. 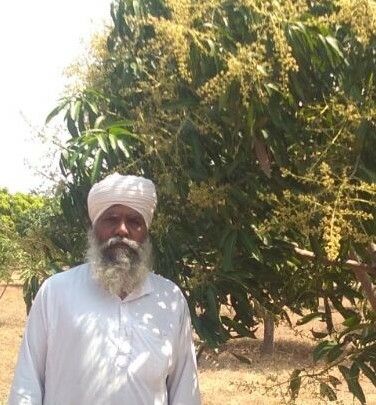 With entire attention on farming they have now gained expertise as which are the fruit trees that would grow best in the soil of Vallandhai village. The farming practice is mix of conventional and organic farming where cow based agri inputs, vermicompost and also chemicals are used. “We try to keep the use of chemicals as less as possible. 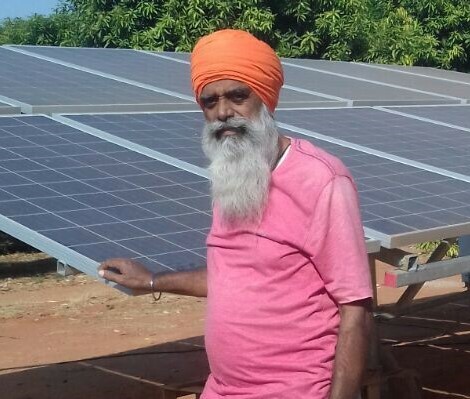 We have an exclusive 4 acre area with mango plantation that is kept 100% chemical free,” shares Mr. Darshan Singh. Farm has a small dairy unit to fulfill the requirement of cow dung for the trees. Approximately 30 kg cow dung is fed in every tree in one year. Mr. Manmohan Singh and Mr. Darshan Singh are not only hard working farmers but also very smart in adopting the latest agri technology available. They want to attain farm-independence in best possible way. To operate the drips and water pumps they required energy so they installed the solar panels, to increase the production they even tried high density farming and also have a bio-gas unit. They learnt Tamil language to communicate with the laborers and locals as required for the farm operations. Trees started yielding from 2016. The quantities were very less but it was encouraging to see the sales coming through. First and foremost the fruit were harvested, packed and taken to Madurai city for selling. However the revenues were not cheering hence they decided to sell the produce locally as it saves the transportation cost and selling price was reasonably high than the mandi prices in Madurai. Year 2017 was indeed promising as the production increased and also buyers started coming on the farm gate as visitors and customers. “We didn’t face any problem in selling the fruits last year. Ramanathapuram district is a completely dry area and doesn’t have any fruit orchard. Therefore our 2016 selling experience gave us the confidence to sell the fruits locally as we were getting same or higher price for all the fruits. Secondly as the area has good green cover now we get many travelers who buy in bulk quantities. All together 2017 was good year for us in terms of sales,” highlights Mr. Darshan Singh. In time to come Punjab origin farmers settled in Tamil Nadu shall expand their area of cultivation as they still have 300 acre left to be turned green. They have acquired still more land because by increasing the farming area the production cost is reduced and yield is multiplied. Papaya and guava fruits would get maximum attention as the farmers have attained the proficiency on its’ production and sales. Cashew is growing and fruiting really well but they are finding it tough to harvest and sell thus at the moment cashew goes down in the preferred options of farming. With patience and perseverance Mr. Manmohan Singh and Mr. Darshan Singh along with other turban folks have brought the fortunes to Vallandhai village. The land prices have appreciated to Rs. 1.5 lakh/acre and local farmers have resumed farming. The entire air of the village is full of warmth as it is greenery all around and social life too has improved because the people from Punjab and Tamil Nadu live in harmony celebrating each other’s festivals with equal joy, relishing food delicacies and sharing the farming intricacies. “We could do it all with the blessings of the Almighty. It is just the beginning we still have a lot of work to complete. If government supports farming and farmers then India can become most powerful and influential economy of the world. Our soil yields gold and in return it only asks for little care and look after that we will proffer for sure,” they conclude.